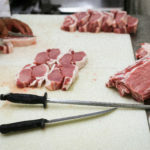 Ever wonder who’s working behind the scenes at Kettle Range Meats? Well wonder no more! Our entire staff works hard to ensure you’re getting the highest quality, best tasting meats in Wisconsin. And we want you to meet them all. First up, Chris Scallon. Chris has become somewhat of a local celebrity in the chili world. 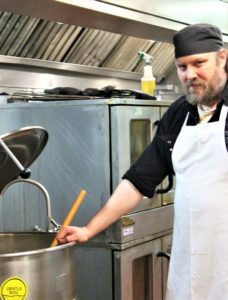 With a Golden Ladle from Potawatomi’s Chili Bowl, and a first place win from WMSE’s Rockabilly Chili contest, he made Kettle Range synonymous with great chili in 2018. What do you do at Kettle Range? I guess my title would be sous chef. I do a lot of food preparation for our heat-and-eat meals. Cutting, slicing, dicing, chopping, packing. I also assist in menu creation, so we can keep adding new items to our overall menu. Oh, and I man the cauldron. The cauldron is what I call our large industrial kettle. It’s where we make things like chicken and beef broth. It’s essentially where the magic begins. What inspires your award-winning chili concoctions? I get a lot of inspiration from the incredible products we have access to. Right from the start, we’re sourcing quality meat from local farms. 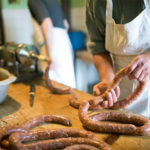 We have a talented butcher staff here that can create amazing products from those meats, like sausages. Those flavors inspire innovative ideas for meals, chilis and side dishes. The Ropa Chili (Rockabilly Chili contest winner) stemmed from one of our heat-and-eat meals, Ropa Vieja. The distinct flavors were incorporated into what turned out to be a delicious and unique chili. The freedom to create new things. We love getting feedback about our meal program. It’s a great feeling to put out a new meal and get a positive response from our customers. Thanks for all you do, Chris! Join Chris this weekend as he defends Kettle Range’s Golden Ladle title at the 13th Annual Milwaukee Chili Bowl. Purchase your tickets at the shop and save $5 on admission!